Not to be confused with Invincible Urchin or Sea Urchin. 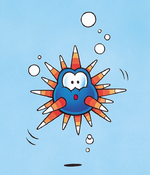 Urchins are spiked aquatic creatures that have appeared as enemies throughout the Mario franchise. As their name and appearance suggest, they are based on real-life sea urchins. They are slow, yet tough enemies that Mario or Luigi must avoid usually because they cannot be defeated by normal means, like a single Jump. Although they live mostly underwater, Urchins can also live on land. In Super Mario World, Urchins move between tunnels in Forest of Illusion 2. Yoshi cannot eat them, but he can bounce on them. Urchins cannot be defeated with fireballs. However, they can be defeated by Grab Blocks. Players must time their movements carefully as to avoid an Urchin's spikes. The Urchins in Super Mario World: Super Mario Advance 2 can be defeated by Luigi riding Yoshi by swallowing a Blurp and spitting it at the Urchin. After a 17-year absence, Urchins appear in Super Mario Galaxy in the Beach Bowl Galaxy, the Drip Drop Galaxy, the Buoy Base Galaxy, the Sea Slide Galaxy, and the Deep Dark Galaxy. In this game, they have a slightly different appearance: they have a different array of spikes, they are slightly larger, have a flatter face, and have visible orange eyelids. However, they do not swim around in the water; instead, they will stay on the sea bottom, and when they see Mario, they start chasing him by rolling towards him. Urchins also appear on land in the Freezeflame Galaxy; they act exactly the same as they do underwater. There are also fuzzy red Urchins on land to go along with the fiery area of the stage; they will act exactly the same as the normal Urchins, and can be defeated if the player lures them into entering the lava, or if they are hit by a fireball shot by Fire Mario or Fire Luigi. A single red Urchin appears in the Deep Dark Galaxy in the Boo in a Box mission as well. The underwater versions can be destroyed with a shell. They release six Star Bits when defeated. Urchins have a unique defeat animation when they get burnt, showing them being turned black with a shrunk center; when other enemies die from fire, they use their ordinary defeat animation. A model of a Big Urchin from New Super Mario Bros. Wii. Urchins appear in New Super Mario Bros. Wii along with a larger version of them called Big Urchins. Urchins start floating up and down like their Super Mario World incarnation, but when frozen with an Ice Flower or Penguin Suit they will float briefly on the water before breaking free and getting knocked out underwater permanently. In this state, the Urchin can block underwater Pipes that spray out jet-streams, which can be used to the player's advantage or disadvantage, depending on the situation. They could also be defeated with a fireball, a Koopa Shell or a Star. Big Urchins are stronger than normal Urchins and only defeated with a Star. In the game, when there is a "bah" in the background music, Urchins will briefly open their mouths, releasing bubbles, as if they were saying "bah" underwater. Urchins reappear in Super Mario Galaxy 2, behaving the same way as in the predecessor. They appear in the Starshine Beach Galaxy and in the Slimy Spring Galaxy. Three red Urchins also appear in this game in the Battle Belt Galaxy. Urchins also appear in the Nintendo 3DS game New Super Mario Bros. 2, where they behave the same way they did in New Super Mario Bros. Wii, and have the same appearance. Small Urchins also appear, acting exactly like their bigger versions, only standing still. Big Urchin and an Urchin for size. Urchins also make an appearance in New Super Mario Bros. U. In Urchin Shoals in Sparkling Waters, Urchins are placed over water geysers used to rise them to the platform surface, when lifted by geysers, they have an angry expression. In Urchin Shoals, Urchins and their big relatives are the main features. Several Urchins, from the Super Mario World cartoon. Several Urchins make a small appearance in the Super Mario World episode "Mama Luigi". In the episode, Yoshi and Luigi, while being chased through an underwater tunnel by a Rip Van Fish, almost swim directly into several Urchins. Luckily, Yoshi and Luigi manage to avoid bumping into these Urchins. In addition, the Porcupinefish from the episode Fire Sale resembles an Urchin. Some Urchins make a small appearance in the Nintendo Adventure Book "Brain Drain", being seen in a large fish tank by Luigi, after Iggy Koopa takes over the WMUSH radio station. In Nintendo Power's Super Mario Adventures comic, several Urchins act as guards in the moat surrounding the Koopalings tower. Though they were seemingly going to make a return in Yoshi Touch & Go, Urchins were not seen in the final game. They were, however, featured in the Balloon Trip tech demo that can be thought of as a Yoshi Touch & Go beta. In the demo, they float in the skies and take one of Baby Mario's balloons away if he touches one of them. They can never be trapped in bubbles, making them some of the more challenging enemies featured in the demo. By the final game's release, these Urchins were redesigned as the plant-like Briers. Urchins also make an appearance in Super Princess Peach. They appear in the Subrella sections of the game. They move back and forth, and cannot be defeated. In Mario Party 9, Urchins appear in the minigame Pier Pressure. The ten fishing rods either have Cheep Cheeps or Urchins at the end of them; if the player ends up choosing one with an Urchin on it, they are eliminated. Blooper also tosses Urchins at the players in its boss minigame, Blooper Barrage. They target a specific player, and their course can be redirected by hitting it with a cannonball. Getting hit by an Urchin results in that player losing one point; hitting it right before it is about to hit the player sends in into the sea below. Additionally, in the minigame Bowser's Block Battle, if Blooper appears on the stage, it attacks by throwing Urchins at the players. In Mario Party 10, Urchins appear in some minigames, such as Fruit of the Doom, where they act as obstacles, and as a selectable enemy in Meanie Match. In Mario Party: The Top 100, Urchins reappear in the minigame Pier Pressure from Mario Party 9, with the same rules. In Super Mario Party, Urchin makes a cameo appearance in the minigame Absent Minded, where he is one of the characters that can be chosen as a guess. Urchins appear in Mario & Luigi: Paper Jam. They are only encountered in Twinsy Tropics, and are usually fought alongside Cheep Cheeps. They can neither be jumped on nor hammered, similarly of how Spiky Parabuzzies work in Paper Mario: The Thousand-Year Door, and can only be attacked via Bros. Attacks or Trio Attacks. If the Urchin is damaged but not defeated, it will eventually blow up, causing major damage to the trio, along with any enemies that are fighting alongside them. The trio can only counter this attack by blocking it. Also, if they are left alone after the trio defeats all the other enemies, they will flee without any experience given. They have low HP but very high defense; their second encounter has the highest defense rate, at 625 (600 in easy mode). Urchins reappear in Mario & Luigi: Bowser's Inside Story + Bowser Jr.'s Journey, where they are found as enemies in the Bowser Jr.'s Journey mode. They are flying troopers, and their spikes damage Minions who attack them physically. They only appear in levels in Plack Beach. At the start of rounds involving them, they are not initially seen with the rest of the squad, rather they jump out of the water to their positions as soon as the battle starts. Urchins and Cheep Cheeps are the two typical Mario franchise enemies in the game that cannot be recruited as allies, due to their shared inability to travel on land. Urchins are spiky blue fish that Mario must face in an underwater challenge in the Beach Bowl Galaxy and a land mission in the Freezeflame Galaxy. They roll along the seafloor or ground trying to poke Mario with their spikes. There are also red Urchins in lava areas that Mario can hit with a fireball or trick into falling into the lava. Level 12 Notice: Stats in parentheses are from the game's Easy Mode. Level 21 Notice: Stats in parentheses are from the game's Easy Mode. Bowser Jr.'s Journey bio: Their bodies are covered with dangerous spikes. They won't join your side... mostly because they can't leave the water. A spiky enemy usually found underwater. "Urchins spend their time floating innocently in water, making it hard for Mario and friends to swim around." A sprite of an Urchin in Super Mario World. An Urchin's artwork in Super Mario World. Artwork of an Urchin from Super Mario Galaxy. Model of an Urchin from Super Mario Galaxy. A red Urchin in Super Mario Galaxy. Artwork of an Urchin in New Super Mario Bros. U.
Unizō From uni (ウニ), meaning "sea urchin". Officially romanised as "Unira" or "Unizo". Spanish (NOA) Ericín From "erizo" (urchin). French (NOA) Oursino From "oursin" (sea urchin). Hacking into Super Mario RPG: Legend of the Seven Stars reveals that the game was initially planned to feature what would appear to be a tiny Urchin, likely as some kind of item. 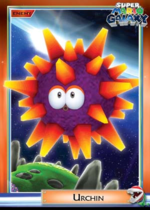 The Super Mario Galaxy trading card for Urchin states that it is a spiky blue fish; however, Urchins seem to be purple in Super Mario Galaxy, and most of their appearances for that matter. They are also not fish, but echinoderms. Their original Japanese name may imply that Urchins were intended to be a redesign or cameo of Unira. In the Super Mario Mash-Up Pack in Minecraft, Guardians are replaced by Urchins. ↑ Shogakukan. 2015. Super Mario Bros. Hyakka: Nintendo Kōshiki Guidebook, Super Mario Galaxy section, page 126. This page was last edited on April 6, 2019, at 21:28.